Yes CB is good, we still have plenty of ways to win under it tho, so its not gamebreaking like it could be against Storm. Good Miracles players usually keeps it in vs me. @Me.Safety: Terminus is definetely not the first discard choice in the matchup if you play it correctly. Which is likely why I have a losing record to it, lol. What is your priority order against Miracles? It really depends on the texture of your hand but among the cards you mentioned, I usually take Swords first if I have a faster hand. That answer requires the least setup and only needs one open white mana. If it's a slower hand then Jace is a high pick because that's one of the ways Miracles really takes over the game. An unanswered Jace is really hard for us to deal with. Snapcaster is another high priority pick because of how versatile it is. Terminus and Council's Judgment are pretty far down there in terms of priority. Terminus requires a ton of setup and Council's Judgment is sorcery speed and costs three mana. -Plow is a high value target, but if you have protection that you can probably resolve (Crops, Fluster, Safekeeper, etc).. you can often leave it. -Snapcaster is pretty high value since it can be a plow at times, but can also be a counter/search/whatever. It can also be pretty tame if you have bog setup or surgical in hand post board. -Council's judgement is pretty low impact unless you are going for a Hexmage kill or have a game breaking permanent that you'd like to protect. -Jace is a card I rarely take. Having the combo up before Jace can be cast is usually a thing depths can piece together. In this spot, Jace costs a virtual 5+ mana. If you sequence your turns/spells correctly, it can be difficult for Miracles to play Jace and not just risk losing that turn. If for whatever reason your hand is weak or they counter a key tutor and you are going to be slower than turn 4, by all means take it. -I often end up taking brainstorm/ponder too. Terminus in hand is more or less dead in the mu without Brainstorm or Jace. -looking for spots where you can double up with surgical post board is also important. Great points from much more experienced players. I wasn't literally listing off cards in my head during each discard, but I appreciate and recognize the wisdom you are mentioning: think deeper through lines of play, there aren't really any hard-and-fast rules. Familiar lines of play can be manipulated by how opponents play, so I need to go deeper. Looking at the top decks in the format our three worst matches are there (they’ve been there for months), miracles, D&T, and ANT. Are we at a point where we need to dedicate more sb slots to these decks? Would more slots really even help? Miracles is not one of Depths worst mu's imo.. In fact, I think most versions of Depths have been favored over Miracles for a while now. Every version has cards that can make life very difficult for Miracles. Everything from Sylvan Library/Safekeeper to Dark Confidant to Bitterblossom to Choke to Flusterstorm to planeswalkers are options that make things harder from the Miracles side. I'd take Miracles off that list (of hardest mu's) and replace it with Moon Stompy or Maverick/4c Loam style decks. If you want to significantly improve vs ANT, the blue splash is the way to go. If you stay in Black/green... lock rocks, hymns, or Mindbreak Traps are probably the best options if you are already on 8+ discard spells. Hi all, possible noob question: I've recently picked up the deck (lower land count, Lotus Petal version). Has anyone else experimented with Dark Ritual? The typical acceleration package is 3 Elvish Spirit Guide and 3-4 Lotus Petal, but the deck just didn't feel "right" to me until I stumbled upon a split of 4 Petals and 2 Rituals. I just felt like black mana was more of a bottleneck, with Hexmage costing BB, and especially if you're playing Hymns. It also adds two mana instead of one, which can help a lot with activating Thespian's Stage a turn earlier, and casting extra discard spells. While Dark Ritual allows for faster Hexmage wins Elvish Spirit Guide lets you combo with only Depths/Stage as your lands. Sometimes a win can be pulled off without casting any spells. It's also fairly critical to have green mana available for tutors, of which Dark Ritual cannot cast. Expedition Map, which is generally the slowest of the tutors, should probably be emphasized if you test out Dark Ritual. Last edited by Mr. Safety; 03-06-2019 at 09:31 AM. Steely Resolve (x2-3) has helped tremendously vs Miracles and DnT. Steely Resolve has one drawback against DnT: they can set up Flickerwisp + Mother of Runes, making it impossible for you to attack through it if you have a Steely Resolve in play; you can't target Marit Lage with Sejiri Steppe anymore. Why are you siding out the needles (that could be good versus Jace, the Mind Sculptor ) and siding in the Nihil Spellbombs? Are they only because Accumulated Knowledge ? 2) Outside of Jace, Pithing Needle doesn't have any targets in the miracles deck. I'm not counting fetchlands, it's not realistic to stifle mana in that deck. 3) His list in particular is loaded up on discard, most notably a potent Khalni Garden + Cabal Therapy synergy. This is very effective at dealing with Swords to Plowshares (in hand) and Jace. 4) Snap/Plow is more problematic than Jace, so graveyard hate not only cuts off AK card advantage but can neutralize Snaps at the same time. That's my take, but I'll let him step in and confirm/add to that. I board out some number of Needles against miracles as well, usually leaving in 1 I think. EDIT: I did notice he takes out Bog and boards in Spellbombs, which seems weird at first glance. Thinking about it, the tutors need to get combo pieces and Nihil Spellbomb frees them up to do that without needing it for Bog. Bog entering at sorcery speed, unable to reliably answer Snaps, puts Spellbomb higher on the priority list. they should enter disenchant/council judgement for your library so needle is not good against jtms, also a resolve library if not answer in the turn is draw 3 while they have all the time of the world to find disenchant/snap for your needle. You already have vampire to answer jtms, and you can also threaten them with a token EOT if they all tap for jtms meaning jace is not effective until turn 5 4mana +stp by this time either you shld have an answer with vampire, draw a lot of card with library or go for the win with mutliple token/protection, after that the game is lost anyway. spellbomb is there for anwser snappy/surgical on depth/the new UU snappy surveil 2 it is also good against akknowledge. An early resolved counterbalance/ B2B is bad news, but i prefer discard to answer that over decay, cause to often you sit with decay in hand and them having no b2b cb but swords in hand and if you don't have a library that's really bad news. Also waiting for a decay to answer a b2b is closed to a lost game it gives them too many time to set up jtms/mentor ftw, the match is already lost close to samething with balance ; so i suppose discard is the best card here for polyvalence. Also seen the new mtgo meta I haven't played much the three/four last weeks moon stompy is tier one and i scoop to it, and miracle is second which a close matchup (harder for my list than death and taxes). Thank you very much to Mr. Safety and adrieng for the explanations. Is Karakas not seen in stock Miracles anymore? I have it in my list... Obviously Ghost Quarter/Wasteland can help, but it is a concern. Many miracle list maximizes basics to fight T1 bloodmoon and leverage b2b. 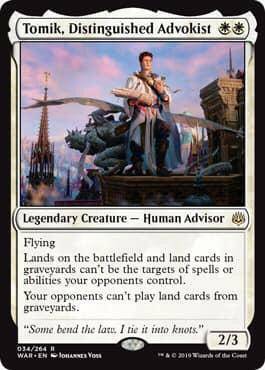 Karakas may come back if monored stompy declines. What about this legendary Advisor? Could be interesting defending our combo pieces?